We’d love your help. Let us know what’s wrong with this preview of My First Signs by Michelle Anthony. 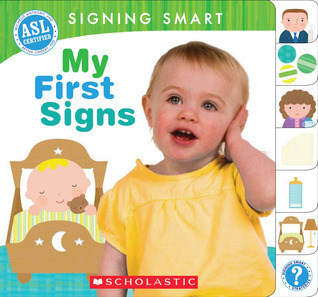 The first interactive board book that introduces children--and their parents--to signing using real ASL signs! With years of experience teaching parents and babies across the country to sign, Michelle Anthony and Reyna Lindert bring their expertise to these interactive board books. Each page focuses on one word, showing a photo of an adult to model the sign. Beside it is a photo of a baby making the sign to ease parents' identification of the sign as young hands might make it. Facing these photographs is an illustration of the object, as well as a touch-and-feel! To ask other readers questions about My First Signs, please sign up. My only hang up on this one is that "bed" is the sign for the physical object (which would be good to use when saying "go make your bed") but when you're trying to prepare them to go to sleep/"go to bed", "sleep" (closing hand in front of face) would probably work better for you. But overall I love this book set up with real life pictures of both a child and adult doing the signs, and plan to look for more of the Signing Smart series! I was reading this book right before bed and I swear when I did the sign for Bed my son picked up his hand and patted his head like the boy in the book. Wicked man. I love these Signing Smart books. There are only a few signs taught, so it's not overwhelming. The graphics and illustrations are cute and easy to follow. Wonderful, ASL certified board book with textures for baby to touch, signs you'll use together and strageties for grown-ups. I love the simple signs and so do the babies in my class. I read through this cool book a couple times and hope I can retain the signs. I still remember several from the other signing book I saw the other day. Fun times! Great new signing for babies book. Michelle Anthony, M.A., Ph.D. is a child development researcher and educator. She is a co-founder of Wide-Eyed Learning, LLC, which teaches parents and educators the Signing Smart approach to using ASL signs with hearing babies and toddlers. She lives with her husband and signing children in Centennial, Colorado.